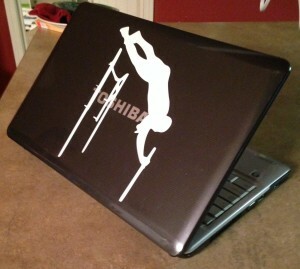 Vinyl decal for high school athlete’s laptop of a pole vaulter. Features a pole-vaulter vaulting over the bar. Click here to order this vinyl decal. Vinyl on the Wall can also design any decal you need. Please check out our custom vinyl lettering tool for vinyl lettering, product page for pre-designed decals that we are constantly adding additional designs for your walls or cars, or contact us to create your own custom vinyl decal.